I was told that Berlin was reading music from a teleprompter. 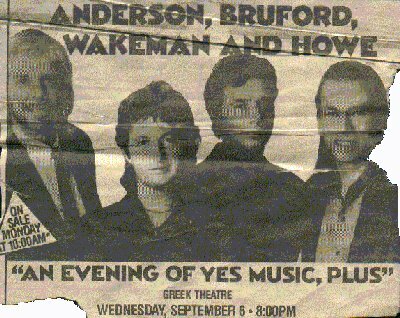 After the first Greek Theatre show I had an opportunity to talk to Bruford, and asked him about this. He chuckled (in his inimitable accent) "Telly-prompter? Nothing as complicated as that. Only pencil and and paper, I'm afraid!" Saw them in L.A. and they DID announce (somehow) that Levin was sick and Berlin was in. My wife and I had a conversation about the issue just before the show.